Stores HTTP entities in RAM. Current implementation uses shared memory. Unlike a disk store (SwapDir), operations are synchronous (and fast). Definition at line 29 of file MemStore.h. Definition at line 102 of file MemStore.h. Definition at line 166 of file MemStore.cc. Definition at line 170 of file MemStore.cc. Definition at line 441 of file MemStore.cc. References assert, Ipc::StoreMapAnchor::complete(), EBIT_SET, ENTRY_VALIDATED, Ipc::StoreMapAnchor::exportInto(), StoreEntry::flags, StoreEntry::hasDisk(), IN_MEMORY, MemObject::MemCache::index, MemObject::MemCache::io, MemObject::ioReading, StoreEntry::mem_obj, MemObject::memCache, NOT_IN_MEMORY, MemObject::object_sz, StoreEntry::setMemStatus(), STORE_OK, STORE_PENDING, StoreEntry::store_status, and StoreEntry::swap_file_sz. Definition at line 401 of file MemStore.cc. References anchorEntry(), hash_link::key, map, Ipc::StoreMap::openForReading(), and updateAnchoredWith(). Definition at line 871 of file MemStore.cc. References assert, CollapsedForwarding::Broadcast(), Ipc::StoreMap::closeForWriting(), debugs, MemObject::MemCache::index, MemObject::MemCache::io, MemObject::ioDone, map, StoreEntry::mem_obj, MemObject::memCache, MemObject::MemCache::offset, Store::Root(), and Store::Controller::transientsCompleteWriting(). Definition at line 466 of file MemStore.cc. References assert, Ipc::StoreMapAnchor::basics, Ipc::StoreMapAnchor::complete(), copyFromShmSlice(), debugs, disconnect(), MemObject::endOffset(), extras, IN_MEMORY, map, StoreEntry::mem_obj, Ipc::StoreMapSlice::next, MemObject::object_sz, Ipc::Mem::PagePointer(), Ipc::StoreMap::readableSlice(), StoreEntry::setMemStatus(), Ipc::StoreMapSlice::size, Ipc::StoreMapAnchor::start, STORE_OK, StoreEntry::store_status, and Ipc::StoreMapAnchor::Basics::swap_file_sz. Referenced by get(), and updateAnchoredWith(). Definition at line 543 of file MemStore.cc. References MemBuf::append(), assert, MemBuf::buf, StoreIOBuffer::data, MemObject::data_hdr, DBG_IMPORTANT, debugs, MemObject::endOffset(), StoreEntry::getReply(), Http::Message::httpMsgParseStep(), MemBuf::init(), StoreIOBuffer::length, StoreEntry::mem_obj, StoreIOBuffer::offset, Http::Message::psParsed, Http::Message::pstate, MemBuf::terminate(), and mem_hdr::write(). Definition at line 657 of file MemStore.cc. References assert, copyToShmSlice(), debugs, EBIT_TEST, MemObject::endOffset(), ENTRY_FWD_HDR_WAIT, StoreEntry::flags, MemObject::MemCache::index, lastWritingSlice, map, maxObjectSize(), StoreEntry::mem_obj, MemObject::memCache, Must, nextAppendableSlice(), MemObject::MemCache::offset, Ipc::StoreMapAnchor::start, and Ipc::StoreMap::writeableEntry(). Definition at line 693 of file MemStore.cc. References Ipc::StoreMapAnchor::basics, mem_hdr::copy(), MemObject::data_hdr, debugs, lastWritingSlice, StoreEntry::mem_obj, MemObject::memCache, MemObject::MemCache::offset, pageForSlice(), Ipc::Mem::PagePointer(), Ipc::Mem::PageSize(), Ipc::StoreMapSlice::size, Ipc::StoreMapAnchor::Basics::swap_file_sz, and TexcHere. Definition at line 48 of file MemStore.h. Definition at line 282 of file MemStore.cc. Referenced by getStats(), and stat(). Definition at line 275 of file MemStore.cc. References Ipc::Mem::PageId::cachePage, Ipc::Mem::PageLevel(), and Ipc::Mem::PageSize(). Definition at line 299 of file MemStore.cc. Definition at line 915 of file MemStore.cc. References Ipc::StoreMap::abortWriting(), assert, Ipc::StoreMap::closeForReading(), StoreEntry::hasMemStore(), MemObject::MemCache::index, MemObject::MemCache::io, MemObject::ioDone, MemObject::ioReading, MemObject::ioWriting, map, StoreEntry::mem_obj, MemObject::memCache, Store::Root(), and Store::Controller::stopSharing(). 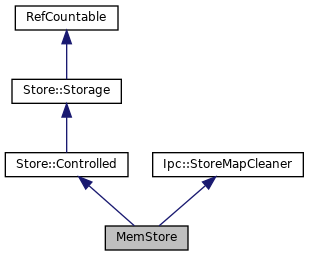 Referenced by copyFromShm(), evictCached(), Store::Controller::memoryDisconnect(), and write(). Definition at line 68 of file MemStore.h. Referenced by MemStoreRr::create(), Store::Controller::init(), StoreEntry::setMemStatus(), and Store::Controller::SmpAware(). Definition at line 942 of file MemStore.cc. References Config, SquidConfig::memMaxSize, Ipc::Mem::PageSize(), and Requested(). Referenced by MemStoreRr::claimMemoryNeeds(), MemStoreRr::create(), and init(). Definition at line 889 of file MemStore.cc. References CollapsedForwarding::Broadcast(), debugs, StoreEntry::destroyMemObject(), disconnect(), evictIfFound(), Ipc::StoreMap::freeEntry(), StoreEntry::hasMemStore(), MemObject::MemCache::index, StoreEntry::locked(), map, StoreEntry::mem_obj, MemObject::memCache, and StoreEntry::publicKey(). Definition at line 908 of file MemStore.cc. Definition at line 306 of file MemStore.cc. References anchorEntry(), copyFromShm(), StoreEntry::createMemObject(), debugs, destroyStoreEntry, Ipc::StoreMap::freeEntry(), map, NULL, and Ipc::StoreMap::openForReading(). Definition at line 207 of file MemStore.cc. References Ipc::Mem::PageId::cachePage, StoreInfoStats::Part::capacity, StoreInfoStats::Part::count, currentCount(), StoreInfoStats::mem, Ipc::Mem::PageLevel(), Ipc::Mem::PageLimit(), Ipc::Mem::PageSize(), StoreInfoStats::Mem::shared, and StoreInfoStats::Part::size. Definition at line 176 of file MemStore.cc. References SquidConfig::cacheSwap, Ipc::StoreMap::cleaner, Config, DBG_IMPORTANT, debugs, EntryLimit(), extras, ExtrasLabel, freeSlots, map, MapLabel, Store::Controller::maxObjectSize(), maxObjectSize(), Must, Store::DiskConfig::n_configured, Store::Root(), shm_old, and SpaceLabel. Definition at line 258 of file MemStore.cc. Definition at line 288 of file MemStore.cc. References Config, SquidConfig::maxInMemObjSize, SquidConfig::memMaxSize, min(), and SquidConfig::Store. Referenced by copyToShm(), init(), and shouldCache(). Definition at line 269 of file MemStore.cc. Definition at line 263 of file MemStore.cc. Definition at line 724 of file MemStore.cc. References debugs, extras, map, Must, Ipc::StoreMapSlice::next, Ipc::Mem::PageSize(), reserveSapForWriting(), Ipc::StoreMapSlice::size, Ipc::StoreMapAnchor::start, Ipc::StoreMap::writeableEntry(), and Ipc::StoreMap::writeableSlice(). Referenced by ShmWriter::copyToShm(), and copyToShm(). Definition at line 810 of file MemStore.cc. References assert, debugs, extras, freeSlots, NULL, Ipc::Mem::PageId::number, MemStore::SlotAndPage::page, Ipc::Mem::PageId::pool, Ipc::Mem::PageStack::push(), Ipc::Mem::PutPage(), MemStore::SlotAndPage::slot, SpacePoolId, and waitingFor. Definition at line 760 of file MemStore.cc. Referenced by ShmWriter::copyToShmSlice(), and copyToShmSlice(). Definition at line 294 of file MemStore.cc. Definition at line 935 of file MemStore.cc. References Config, SquidConfig::memMaxSize, and SquidConfig::memShared. Referenced by EntryLimit(), and MemStoreRr::finalizeConfig(). Definition at line 771 of file MemStore.cc. References assert, Ipc::Mem::PageId::cachePage, debugs, Ipc::StoreMap::entryCount(), freeSlots, Ipc::Mem::GetPage(), map, NULL, Ipc::Mem::PageId::number, MemStore::SlotAndPage::page, Ipc::Mem::PageStack::pop(), Ipc::StoreMap::prepFreeSlice(), Ipc::StoreMap::purgeOne(), Ipc::Mem::PageStack::push(), Ipc::Mem::PageId::set(), MemStore::SlotAndPage::slot, TexcHere, and waitingFor. Definition at line 580 of file MemStore.cc. References assert, debugs, EBIT_TEST, MemObject::endOffset(), ENTRY_SPECIAL, MemObject::expectedReplySize(), StoreEntry::flags, HERE(), IN_MEMORY, MemObject::isContiguous(), SBuf::isEmpty(), map, max(), maxObjectSize(), StoreEntry::mem_obj, StoreEntry::mem_status, MemObject::memCache, StoreEntry::memoryCachable(), MemObject::MemCache::offset, and MemObject::vary_headers. Definition at line 634 of file MemStore.cc. References assert, debugs, MemObject::expectedReplySize(), HERE(), MemObject::MemCache::index, MemObject::MemCache::io, MemObject::ioWriting, hash_link::key, map, StoreEntry::mem_obj, MemObject::memCache, StoreEntry::memOutDecision(), Ipc::StoreMap::openForWriting(), Ipc::StoreMapAnchor::set(), and Ipc::StoreMap::startAppending(). Definition at line 220 of file MemStore.cc. References Ipc::Mem::PageId::cachePage, currentCount(), currentSize(), Math::doublePercent(), Ipc::ReadWriteLockStats::dump(), Ipc::StoreMap::entryLimit(), map, maxSize(), Ipc::Mem::PagesAvailable(), PRId64, Ipc::StoreMap::sliceLimit(), Ping::stats, storeAppendPrintf(), and Ipc::StoreMap::updateStats(). Definition at line 418 of file MemStore.cc. References assert, StoreEntry::hasMemStore(), MemObject::MemCache::index, map, StoreEntry::mem_obj, MemObject::memCache, Ipc::StoreMap::readableEntry(), and updateAnchoredWith(). Definition at line 432 of file MemStore.cc. References Ipc::StoreMapAnchor::basics, copyFromShm(), Ipc::StoreMapAnchor::Basics::swap_file_sz, and StoreEntry::swap_file_sz. Definition at line 338 of file MemStore.cc. References Ipc::StoreMap::abortUpdating(), assert, debugs, MemObject::MemCache::index, map, StoreEntry::mem_obj, MemObject::memCache, Ipc::StoreMap::openForUpdating(), and updateHeadersOrThrow(). Definition at line 358 of file MemStore.cc. References Ipc::StoreMapUpdate::Edition::anchor, ShmWriter::append(), Ipc::StoreMapAnchor::basics, Ipc::StoreMap::closeForUpdating(), debugs, Ipc::StoreMapUpdate::entry, extras, Ipc::StoreMapUpdate::Edition::fileNo, Ipc::StoreMapUpdate::fresh, StoreEntry::getReply(), Http::Message::hdr_sz, ShmWriter::lastSlice, map, Must, HttpReply::packHeadersUsingSlowPacker(), Ipc::Mem::PagePointer(), Ipc::Mem::PageSize(), Ipc::StoreMap::readableSlice(), Ipc::StoreMapSlice::size, Ipc::StoreMap::sliceContaining(), Ipc::StoreMapUpdate::Edition::splicingPoint, Ipc::StoreMapUpdate::stale, Ipc::StoreMapAnchor::Basics::swap_file_sz, and ShmWriter::totalWritten. Definition at line 832 of file MemStore.cc. 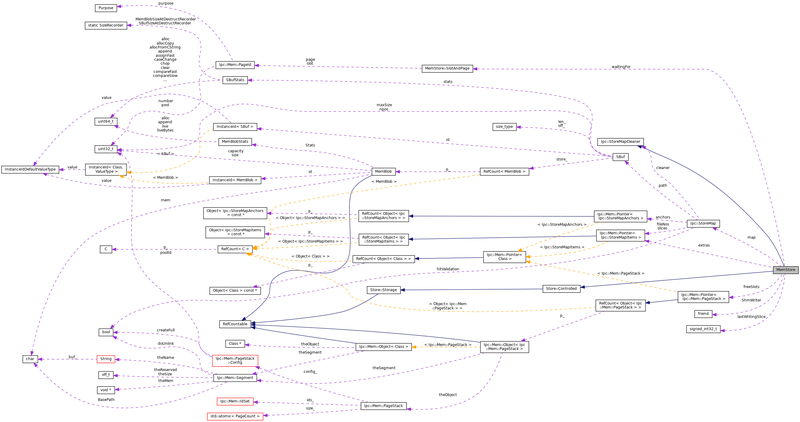 References assert, CollapsedForwarding::Broadcast(), completeWriting(), copyToShm(), debugs, disconnect(), MemObject::MemCache::io, MemObject::ioDone, MemObject::ioReading, MemObject::ioUndecided, MemObject::ioWriting, StoreEntry::mem_obj, MemObject::memCache, StoreEntry::memOutDecision(), shouldCache(), startCaching(), STORE_OK, and StoreEntry::store_status. Definition at line 103 of file MemStore.h. Referenced by copyFromShm(), init(), nextAppendableSlice(), noteFreeMapSlice(), pageForSlice(), and updateHeadersOrThrow(). Definition at line 99 of file MemStore.h. Referenced by init(), noteFreeMapSlice(), and reserveSapForWriting(). Definition at line 106 of file MemStore.h. Referenced by copyToShm(), and copyToShmSlice(). Definition at line 100 of file MemStore.h. Referenced by anchorToCache(), completeWriting(), copyFromShm(), copyToShm(), currentCount(), disconnect(), evictCached(), evictIfFound(), get(), init(), nextAppendableSlice(), reserveSapForWriting(), shouldCache(), startCaching(), stat(), updateAnchored(), updateHeaders(), updateHeadersOrThrow(), and ~MemStore(). Definition at line 75 of file MemStore.h. Definition at line 117 of file MemStore.h. Referenced by noteFreeMapSlice(), and reserveSapForWriting().